a green avocado: Tiramisu for a May weekend. Tiramisu for a May weekend. So finally it's really May! Sure - it still gets cold in the evenings, and I haven't dared to pack my winter jacket into the bottom of the 'seasonal clothes only' suitcase in the basement, but at least I did take out my spring coat! And in this very spring coat, halfway unbuttoned I paraded to and from work yesterday - with a big smile on my face. 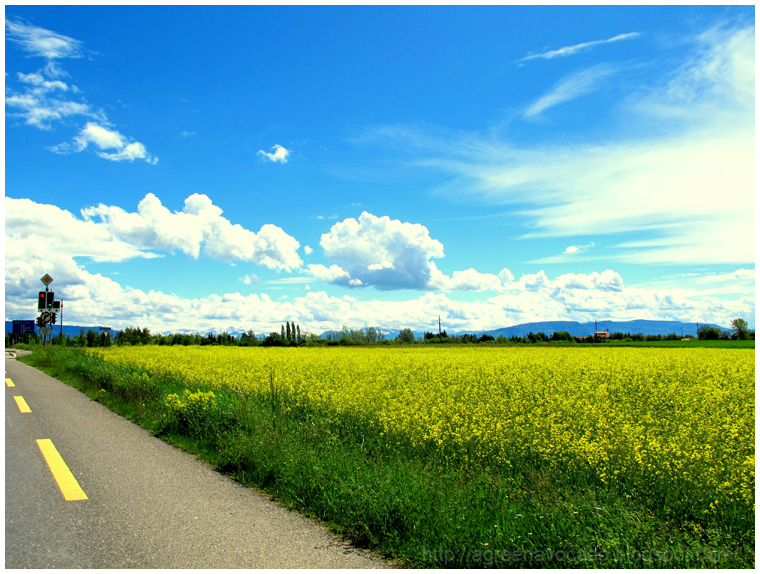 perfect blue skies, green grass and yellow blooming fields.... What a nice beginning to this spring weekend! 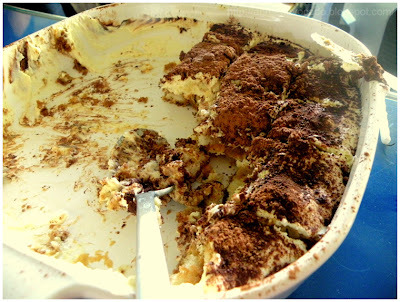 I ate the original tiramisu at an Easter get-together with my high school girlfriends and completely fell in love with it. I realize of course that there's a recipe for tiramisu on every mascarpone box, but this was really special, and tasted amazingly delicious while chit-chatting and catching up after months of not seeing each other. So I decided to try it myself and as usual, all I needed was a good occasion. And then it appeared - another friend's from the office birthday + I discovered that it was an anniversary of me working with them! Voilà, the excuse ready! 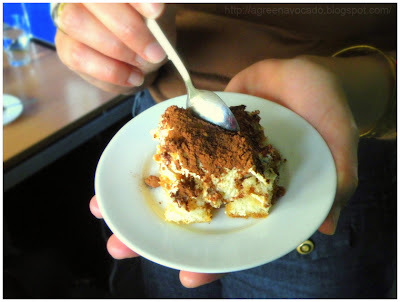 Tiramisu - simple cake for many occasions. 1. In a glass bowl (here 20x20cm) arrange half of the ladyfingers in order to fit the bottom, then soak them with half a cup of coffee + alcohol mix. 2. Beat egg yolks and sugar until thick and pale, for about 5 minutes. Add mascarpone cheese and beat until smooth. 2. Beat egg whites in a separate bowl until thick (turn the bowl up side down, it's ready when the mixtures stays attached to the bottom of the bowl). Then gently add to the egg yolk mix. 4. Spread evenly 1/2 of the mascarpone + egg whites mixture over the ladyfingers (about 2-3cm layer). Arrange another layer of ladyfingers soak with coffee and top with remaining creamy mixture. 5. Cover tiramisu with plastic wrap and refrigerate for at least 2 hours. Before serving, sprinkle with dark cacao. I've decided to share this recipe here because of the combination of its simplicity and deliciousness - very high rankings in both. The final product looks very yummy, unless of course it's more than halfway gone - as on the here attached photo. But it only means that they loved it - what else is there to want? Every excuse is a good excuse - when it comes to tiramisu ;) Pycha! Pea soup for a cold evening.